In the last couple of videos that I posted to YouTube, I discussed my straight, heat damaged bangs and how I styled them so that they would blend in with the rest of my hair. Shortly after posting those I started a six week Wash n’ Go binge and wore my hair curly the whole time. 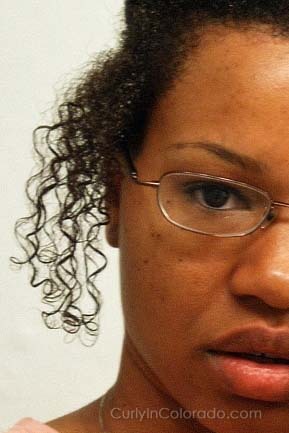 For a while I was fine with pushing the straight pieces back or braiding the hair into a headband. 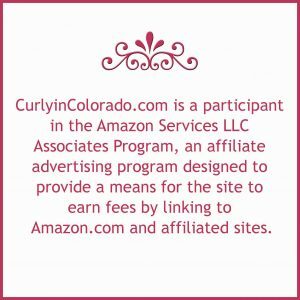 During this time I was also reading the Curly Girl Handbook by Lorraine Massey and learning more about my curls and how to work with them. 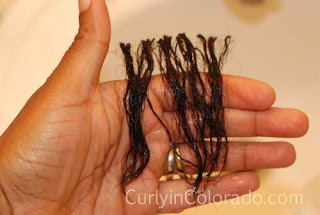 I kept looking at my damaged hair and wondered, why was I holding on to the straight pieces? After much contemplation, I finally decided to break out the shears. I already knew that I had curly bangs in my future so why not just get on with it? First, I wet the hair that I sectioned off for the cut. 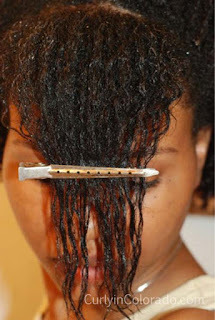 This made it easier to tell where the textured hair met the straight ends. Then I placed a long metal clip across that line of demarcation and cut. I thought that would do it but the straight pieces were still another inch into the length of my bangs so I snipped again. 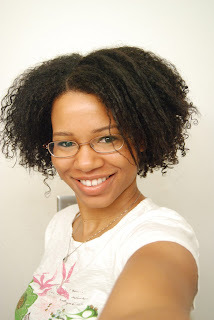 I was surprised to see a small, one inch section where my hair was just blah; not really curly or straight. The rest of the bang was curling up the way I expected. I ended up with a Betty Paige style look which for me was just fine. It’s been about a month and a half since the mini chop and I have to say that for the most part, the bangs are fine by me. 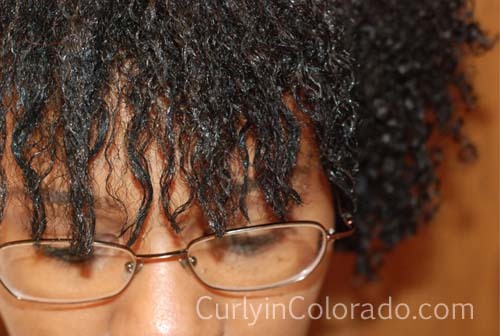 The curls are in good shape even after wearing my hair straight a couple of times. 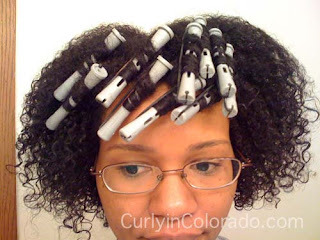 I refuse to use my flat iron on that area because the 400 degree temperature is just too much. Instead I use my Gold n’ Hot Curling Iron which only gets up to 300 at best. I’m also liking the Paul Mitchell Super Skinny for my heat protectant these days. I do wish the bangs were a teensy bit longer though so that it would be easier to braid them down into a cute headband. 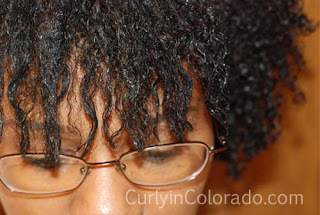 Of course this is possible with a little help from my Eco Styler gel. I’m also realizing that I won’t be able to slick all of my hair back for awhile. For now though, I’m just enjoying the new look and loving the curls. ﻿﻿﻿﻿﻿﻿﻿After my most recent bout with heat damage, I wasn’t too sure how to go about getting my curls back. I wore my hair straight for Easter Sunday but decided to use the flat iron again later in the week after using oils in my hair. 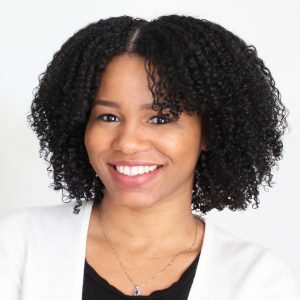 My curls did not revert back like they normally did when I wore my hair straight and I was afraid that the damage was permanent. Was I upset? You damn skippy I was! I couldn’t believe that I let this happen again. Not only that, I just chopped off 1/2″ of damage at the start of the year which gave me curls galore. Now I was right back where I started and worse. What did I do you ask? Well, I did what I always do when I need answers, I went to the internet. I was pretty certain that what I was experiencing was permanent heat damage but I was really hoping that someone out there had a magic remedy. 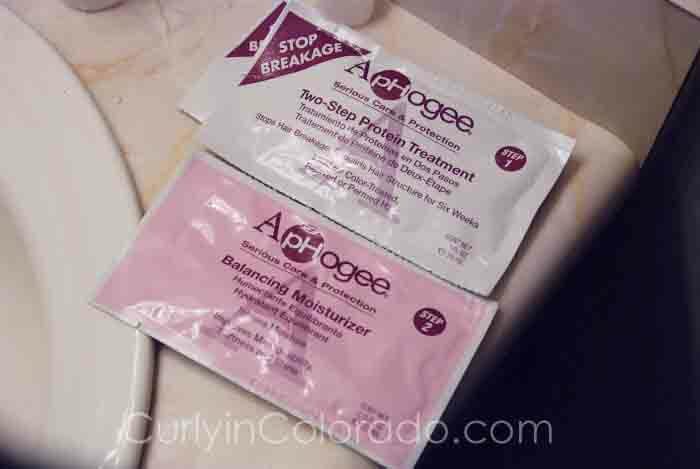 I stumbled onto a YouTube video that I remembered watching by Taren916, where she used the Aphogee 2 step Protein Treatment to help repair her heat damage. She showed a before shot where her hair was limp and not so curly and another after the treatment when her hair had more texture. 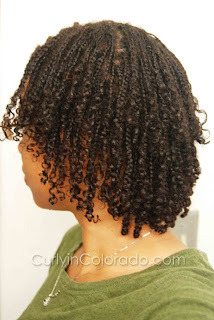 ﻿﻿﻿﻿﻿﻿﻿﻿﻿﻿﻿﻿﻿﻿﻿﻿﻿﻿After watching that, I went to the hair forums and read articles for more info on how the protein treatment worked. 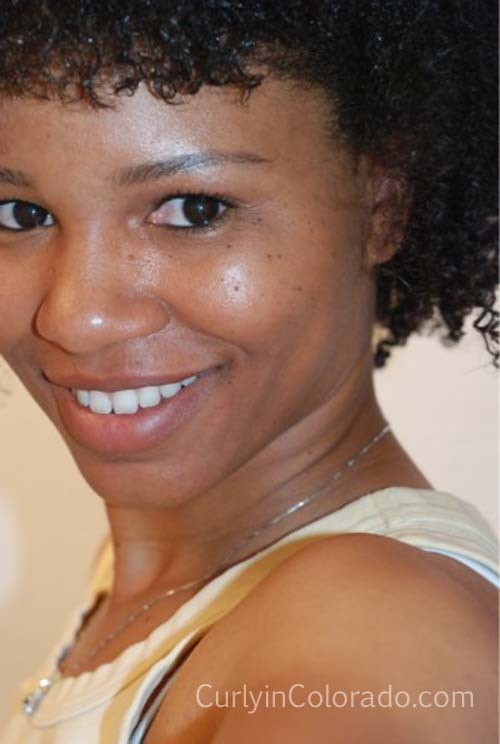 Basically, heat can cause significant damage to the cuticle layer of the hair strand. This is the protective outer layer (imagine tiny shingles that overlap one another). Once these cuticles are damaged, the hair is vulnerable and more prone to dryness and breakage. The protein in the Aphogee treatment helps to fill in the gaps where the hair strand is missing these important little pieces. So, the very next day, I shot over to Sally’s and made a B-line for the Aphogee products. I still wasn’t too sure if this was all I needed so I grabbed a silicone based conditioner (the GVP version of Paul Mitchell’s The Detangler) and said a prayer. After the application and rinsing it all out, I was very surprised to see curls where there was once very non-descript strands. The treatment actually worked, but the curls were still looser than before (as you can see from the photo). My hair was still much thicker at the roots. Afterwards, I decided to go back to an old regimen I employed when I used to use semi-permanent color on my natural hair. My curls 4 weeks after the treatment. I added the silicone conditioner because the primary reason for using silicone in hair products is so that it can help mask damage incurred by heat styling, hair color and chemical treatments. Thankfully, my hair is back to being nice and curly but is just a bit more stretched than before with a few lazy curls here and there. Some people use heat for this effect but that was never my intention. Needless to say, me and my curls are stepping away from the heat for a good, long while.